Most people like fruit, but get in a rut in terms of how they snack on fruit. I admit that I do, and it gets boring to just eat slices of melon, pop grapes, bite in to an apple, etc. Making a fruit salsa is a fantastic and fun way to snack on fruit. You can use pretty much any fruit you want based on your preferences or what's in season / looks good at the market. And, every salsa needs a chip counterpart, right? 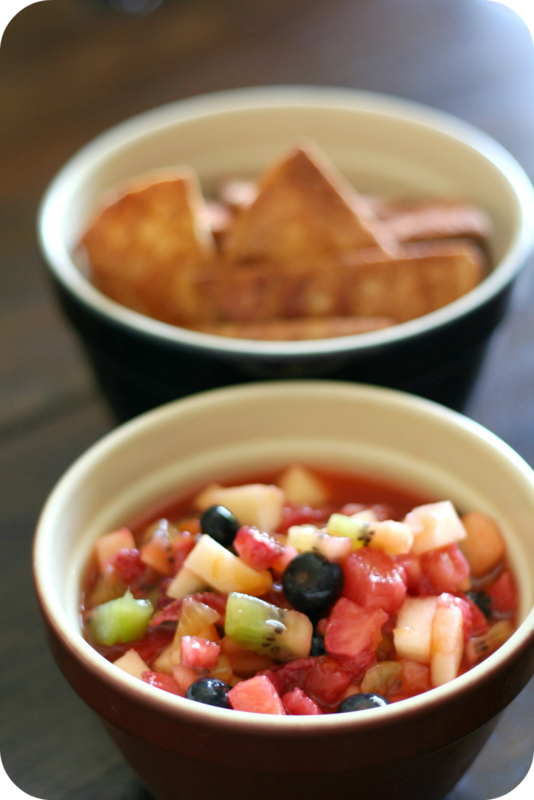 Cinnamon tortilla chips are the perfect companion to a fruit salsa, and so easy to make! My favorite thing about this recipe is how adaptable it is. The strawberries at the market looking a little like a hot mess - use raspberries instead. You forgot to buy apples but have peaches? Go for it! This salsa is amazingly easy to assemble, and really the only time consuming part is chopping the fruit, but you'd be doing that if you were snacking on plain fruit anyway, right?! In a large bowl, thoroughly mix kiwis, apples, berries and preserves. Cover and chill in the refrigerator for at least 15 minutes. Mix cinnamon and sugar in a small bowl. Using a pastry brush, coat one side of each tortilla with a thin layer of melted butter. Sprinkle with cinnamon sugar mixture and lightly press in to butter and tortillas. Cut in to wedges and arrange in a single layer on a large baking sheet. Bake in preheated oven 8-10 minutes. Repeat with any remaining tortilla wedges. Allow to cool and serve with chilled fruit mixture. Pretty! Thiѕ has been a really wonderfսl article. Ҭhank you for ρroνiding these detаils.